Tadeja: As a lesbian I was always interested in lesbian theory and activism, gender and women studies. It helped me through self-acceptance and gave me the answers on many questions I had as a lesbian and as a woman. And talking with my friends I realised that I don’t know enough about feminism so we started a Lesbian-feminist university (LFU) in March 2010, where we read and discussed theoretical texts and movies, exhibitions and so. Being a feminist activist is important for me as a woman and as a lesbian. Enci Brenci: Firstly, me and Tadeja and one other girl formed a group which aspired to make a first positive lesbian Slovenian movie. After that we helped to organise parties and cultural events at the only lesbian club Monokel at Autonomous Cultural Cone Metelkova. In 2007, I became a coordinator for lesbian club Monokel which lasted till the end of 2009. Enci Brenci: I have been reading feminist and lesbian literature which inspired me for critical evaluation of the world. The needs sprang up out of critical view on the present events and other media. 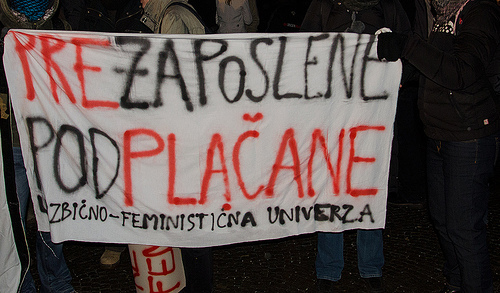 There is lack of critical Slovenian lesbian and feminist sources on the internet. Where did you learn the skills for producing this media? Tadeja: Our blog is not a professional media so there are needed no special skills for writing an article/critics /announcement/...Those skills, which we learned through educational system, and having a touch for this things, is enough. One of us, Enci Brenci, made a blog, and now we just put our things on. Of course we help each other and try to make our best (we talk about published things, discuss what’s good and what’s not so good, what can we do better next time, talk to people who read it and try to go a step forward each time). So we learn something new each time and becoming better and better. Enci Brenci: From my female friend who is a computer geek and specialist in web content; she held a blog and that inspired me to start a blog on my own. Firstly, I wrote the blog in some other speciality for 2 years. I learned to use blog from her and from another female friend who is also a computer specialist, after that I learned by experimenting by myself. Generally, to blog is really easy. Are there any examples of feminist media that inspired you in your work? Tadeja: Books of American and other western writers (mostly lesbians), movies and documentaries of world well known feminists and lesbians. Blogs and articles of some Slovenian feminists. Festivals which focus on women, gender and LGBT topics (like Rdeče zore, Mesto žensk, FGLF,...). In the past there was great magazine called Lesbo (Slovene political, social and cultural non-profit making quarterly, published by the lesbian group ŠKUC-LL), now we have special editions called Gender in the magazine Apokalipsa. But mostly I would say is talking and exchanging opinion and information with other feminists. Please could you tell us about the formation process of your media? Tadeja: As I already mentioned, we wanted to stress certain problems, discrimination, politics in society. We wanted to say things, loud and clear. We wanted to create a femzine with important issues, but it was faster and better to create a blog first. So one of us did it and then we just started to write about things that bothered us, that weren’t said in public, things which were left out on purpose. To document all this. We publish as much as we can and the number of us is increasing. We want to give open space to all those women who want to speak, but don’t have place or energy to do it by themselves. They can publish thing anonymously, using pseudonym or their full name. Enci Brenci: We found it very important also to have an autonomous web space for expressing our opinions, place invitations to events and present relevant information about other feminist events, books etc. at one place. What was the initial idea / motivation when you started/got involved in this media project? Tadeja: I was angry on the situation, the lack of information, the silence. I wanted to say things not just to my friends, but widespread them. Make them visible and permanent. Make women and society think of what’s going on and give them (women) power to say “No, that’s enough. We won’t let us be discriminated, pushed in the shadow, be second best. We will fight.”. Writing is my way of fight, fight for women rights, LGBT rights, human rights in general. Enci Brenci: I wish to have an autonomous web space, to present our project, to place invitations to feminist and lesbian event and to present relevant feminist and lesbian topics at one place. How has this media project progressed since then? Tadeja: We are still very young (we started it in March 2010) so it’s hard to say. But the number of us, who write, and the number of posts, is increasing. We want to continue with that and start publishing femzine as well. Enci Brenci: It progressed in the way of a blog, which we update at least every 2-3 days. We respond to public hot issues and also place argumented opinions. It is visited by relatively high number of visitors. Unfortunately, we do not have any content in English yet. Can you describe the process of making your media? Wow many people are involved in the process of making? Tadeja: In the beginning there were 4 of us, the most enthusiastic, who started it. We created the blog and published first posts. Later few more came with their ideas and posts and we hope to get more of them in future. But the main core is still the same. Tadeja: We are all quite young, all in our twenties. Two of us finished university; two of us are still students. Most are high educated. We’re all lesbians. Most of us come from middle class. Enci Brenci: Most important, we are all lesbian activists at the club Monokel. Tadeja: We have support of older women, who have master or work for years as activists. Are you working in a collective in flux or in a stable group? Tadeja: We work as sisterhood, in a stable group. We meet at least twice a month and discuss things on LFU, for the blog we talk and meet more often, we discuss things in personal or through mails. We are also friends and do know each other from before we started LFU/blog. Do you co-operate with other feminist, lesbian or/and other LGBTIQ media? Tadeja: Yes, we co-operate with feminists and lesbians in ŠKUC-LL (they have a publishing house called Vizibilija and they publish lesbian books), we start to co-operate with women gathered around the magazine Apokalipsa, we also co-operate with other feminists who are not in a special group, with individuals. Enci Brenci: Concerning our media, we hold links to their sites. I hope we will develop other web connections in the future. Are you part of a feminist, lesbian or/and other LGBTIQ network? How do you position your media in relation to wider LGBTIQ, feminist or political movements? Enci Brenci: It is the youngest media website. Tadeja: Yes, we are still quite young, but I think already known among LGBTIQ and feminists in Slovenia. We’re started to talk about things which were already talked in the past but later forgotten and are still problems in the society nowadays. Old feminists are happy to get some new energy and fresh ideas, new fighters. I think we’re also quite radical and that’s good. It’s also good that there is a blog, something written, not just spoken in small circle of women. Which skills are important to produce your media? Tadeja: I think the most important things are awareness, courage and energy to do something, to fight. Of course is good to know how to write, but that’s not main thing. We want to stimulate women to think, be critical, demand our rights. Important thing is an idea and realising of it, an action. Spreading information and awareness. Helping and supporting each other. Enci Brenci: For producing the blog, the skills of writing, journalism skills, web content skills, searching for relevant information. What would you describe as the main content of your media? Enci Brenci: We include information about the Lesbian-Feminist University, critical content and documenting graffiti and guerrilla actions. Enci Brenci: Content has to be about women, feminism or LGBTIQ. Tadeja: Not yet. We’ll do a call in future to get some money, but for now we don’t have founding. Enci Brenci: The events of Lesbian-Feminist University are funded by City of Ljubljana, but making the media is voluntary. Tadeja: We promote it through our friends and our LGBT programme we’re doing in the club. LFU is a part of programme in lesbian club Monokel, so we announce events on our website (Kulturni center Q; club Monokel is a part of it) and through different mailing lists. Link to our blogs is also on different LGBT websites. Mostly we use a method of snow ball. Enci Brenci: We make links to other websites, but I don’t know, how much useful it is. What are the challenges of producing your own media? Tadeja: The challenges are to be productive all the time, since we all work other things beside this. To be creative and to do as much as we can. And to be good and objective in what we do. To stand for what we write and go further. Enci Brenci: I would really like that also other women from Lesbian-feminist university would post their own information and critical commentaries to this website. I would like that this website would be media for placing women´s/lesbian autonomous voices. Tadeja: The main obstacle is lack of time and energy (since we all do other things for living). Sometimes we are bothered by people who don’t agree with what we write. Enci Brenci: For me, the main obstacle is lack of time to educate and make many well argumented critical posts. What is the feminist self understanding of your media? There are many different feminism - e.g. Black feminism, postcolonial feminism, pop feminism, queer feminism. Tadeja: I cannot talk in the name of all us, just in my own – I must say that I’m not familiar with all different feminism so it’s hard for me to talk about that. I think of us simply as lesbian feminists, close to queer feminism, but not just that. I consider it as place where I can express myself, where I can find answers to my questions and give something of my own. Enci Brenci: I consider it an autonomous web space for different women’s and lesbian voices. How are you dealing with all these different feminism? Enci Brenci: I think that the lesbian feminism in Slovenia is very practical, alternative, non-university feminism. The straight feminism is more university-placed. Tadeja: I’m not thinking about that much, we just do what we want and what we think has to be done. I have our own path and don’t bother with definitions or labels. Could you describe the kind of feminism that is represented in your media? Tadeja: As I said we have just begun and don’t think we already have some special kind of feminism. I see it as a mixture of different feminism. Enci Brenci: I find it a lesbian feminism. Is there any feminism which are very important for your media? Tadeja: All of them, I believe. We take a lot from so called second-wave feminism, queer feminism, post feminism. And from older Slovenian feminism. Enci Brenci: I consider it lesbian feminism and in general, left feminism. Can you make your living from working as an editor and from writing? Tadeja: No, not with this kind of media. It’s very hard to make a living from working as an editor in Slovenia unless it’s a well known publishing house. Mostly it’s just something you do for pleasure, beside your “real job”. As a writer you can do it, but it’s still very very hard, you have to be well known and get awards for your work. Mostly you have to do something else besides writing. Enci Brenci: At this point, no way. I also doubt that could be possible in the future. Tadeja: It’s a small country with small market and there was always lack of money for culture, especially if your field is feminism. It’s still stigmatised in Slovenia and it’s difficult to get money for this kind of writing. In what ways has making these media projects helped in your career? Tadeja: It helped me mostly on personal level, but I think it will help me also in my career. Enci Brenci: I learned the power of blogging and making web media. In what ways does your media project intersect with activism or broader political engagements in your life? Tadeja: It’s very important for me because I’m not just a woman, or a lesbian, or a feminist. All of that is Me. It influences my way of thinking, working, being. It helped me to get answers on so many questions I didn’t get elsewhere, it broaden my mind, help me learn new things. I see myself different now and because of that I’m a better persona and can work better as an activist. It’s like I found a piece which was missing before. And now I can see things clearly and work better. Enci Brenci: It is an important part of activism which is also reached by other people, who are not at the “scene”.